Classic PC adventure games such as The Curse of Monkey Island and Maniac Mansion are nearly impossible to play on modern computers because they were developed in LucasArts' SCUMM (Script Creation Utility for Maniac Mansion) scripting engine and designed to run in DOS. If you have a few old games lying around that you’ve been itching to play again, grab the open-source emulator ScummVM, and set it up using this simple guide. First, download ScummVM from the ScummVM website. The enterprising developers who contribute to the project have designed versions of ScummVM for major platforms such as Windows 7 and Mac OS X, as well as for Linux, iOS, Android, and even game consoles like the Sony PlayStation 3 and Sega Dreamcast. No matter what kind of device you’re using, make sure to download the latest version of ScummVM that’s compatible with your operating system. 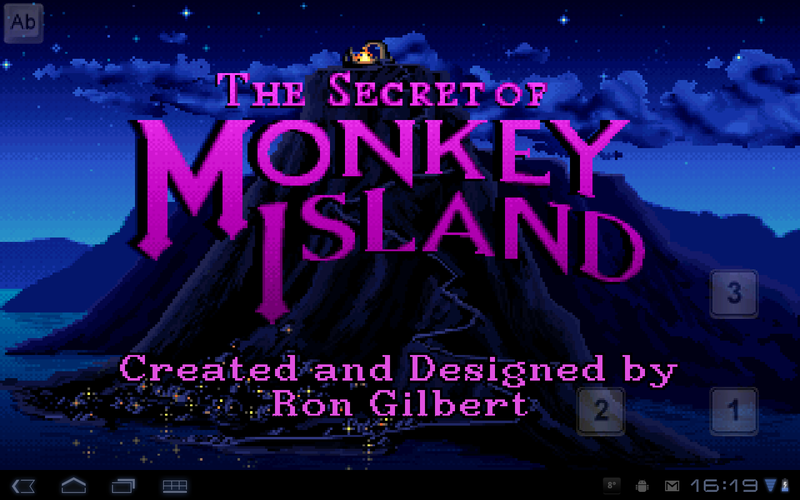 LucasArts' classic adventure game The Secret of Monkey Island can run on an Android tablet thanks to ScummVM. Next, you need to install ScummVM. Note that this process differs depending on the version; for example, while the 32-bit Windows 7 version of ScummVM comes packaged inside a Windows installer program, you may have to unzip the files manually on other systems. In some cases, such as when you're installing ScummVM in Mac OS X or on a Sega Dreamcast, you’ll need to mount ScummVM as a disc image (or burn the image to a disc that your game console can read). If you have any trouble with obscure devices or outdated files, consult the helpful community on the ScummVM forums for assistance. After you successfully install ScummVM, you have to copy all the files from the game to a directory on your hard drive. If you still own a physical copy of a SCUMM game such as Full Throttle or Zak McKracken and the Alien Mindbenders, go ahead and copy the entire game directory to a clearly labeled folder on the hard drive. For the purposes of this guide, I've downloaded a copy of Revolution Software's 1994 sci-fi adventure game Beneath a Steel Sky. Although Beneath a Steel Sky is based on a different scripting engine, it is compatible with ScummVM; the game's creators made it publicly available in 2003, and you can download a copy for free from the ScummVM website. Next, boot up ScummVM and choose Add Game from the opening menu. Navigate to the directory on your hard drive where your game of choice resides, highlight the game directory, and click the Choose button. Make sure to select the entire game directory, and not just a single file (such as the game executable), or else ScummVM will be unable to run the game. ScummVM offers a cornucopia of interface options for customizing the game. Now you’re almost ready to play. If ScummVM can run the game, it should offer a small options window in which you can configure game settings such as the audio levels, the graphical quality, and your MIDI preferences. Once you’ve tweaked the game to your liking, click OK to confirm and to return to the main game list. Congratulations, you’ve successfully configured the ScummVM emulator to run your classic game on a modern device! From here you can repeat the process to add more games to your ScummVM list, or just select a game and click Start to dive in and play. Here's how to get the classic LucasArts adventure game up and running on your Windows 7 computer. Here's how to get The Elder Scrolls II: Daggerfall running on your modern computer. DOSBox is a vital tool in any classic gamer's arsenal. We'll show you the basics. With a few steps, you can get Mechwarrior 4: Mercenaries running on your modern computer.